« Why does your website need a Website Redesign? What are the tell-tale signs? What questions should you ask before considering Website Redesign? Is it time for you to change the way your website looks? For most website owners, there’s only one factor to consider in determining the timing for a website redesign — budget. Website owners usually accede to a website redesign proposal when they have some money to spare. But there are times when monetary considerations should not only be the consideration. If you are not sure when the right time for you to redesign your website is, you might want to answer the following questions. 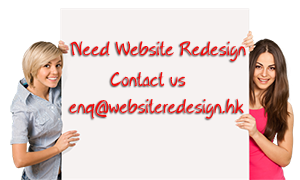 If you answer in the affirmative, then you ought to have your website re-designed as promptly as possible. Does it take a long time for your website to load? Did you know that the typical Internet user is impatient to the point that he or she will only allow a website to load for five seconds or less? If it takes more than five seconds for your website to load, your online guest will most likely close the window or look for another website. Netizens are easily disinterested in websites that takes too long to load, especially those who have slower bandwidths. You should also keep in mind that the amount of time it takes for your website to load is more important these days, especially with more Internet users using their mobile devices like smartphones to go online. Remember that smartphone carriers usually have a cap on their data, so those who use smartphones are wary of going to websites that downloads lots of images and text because it costs them precious data. Are Guests Navigating Past Your Main Page? The best way to you to gauge this is by signing up for Google Analytics or a similar service. By having a Google Analytics app on your website, you can determine whether or not your guests are navigating deeper into your website. Navigating deeper means going through your web pages, especially the more important parts like your contact page. In case your visitors are skipping pages, then you might need to make your home page more enticing or attractive to the casual Internet user. You could put a couple of photos, or add an article or two so that the Internet visitor will be motivated to browse your website. Or you can put all the important information on the main page such as your contact numbers, or the photo or description of whatever you are selling. Are You Found on The First Page of a Google Search Result Page? Your website’s ranking on a Google search result page has a major impact on the number of hits your Internet site gets. Ideally, you’d want your website to be on the first page of a search engine result page. If your website is not found anywhere on the first page, then it’s high time to hire a website redesign company to redesign your website and incorporate some search engine optimization (SEO) strategies. This can improve your search engine rankings and boost your website traffic.